Attention Hikers: Parks Forward, a high-level commission wants to reform the troubled California State Parks system, and it wants our comments. Baldwin Hills Overlook State Park attracts a diversity of hikers with pathways, a stair-climb, and great metro vistas. Number One priority of the commission is to improve the California Department of Parks and Recreation—its leadership, finances, culture and almost everything else about the agency. The Commission’s half-dozen recommendations include creating a new nonprofit organization to work with the department and to work harder at protecting resources and combating climate change. Phew! 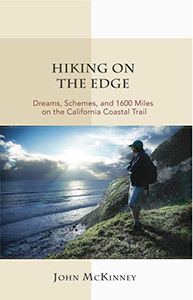 As for reforming the California State Parks system, well, I regret to report that I don’t happen to have a 100-page socioeconomic treatise to share that might solve what ails our parks and move state government to action. In fact I thought of the state parks system last weekend when the USS Ronald Reagan came to visit Santa Barbara last weekend. Allow me a moment to explain why the huge carrier reminded me of the park system. The USS Ronald Reagan generates a lot of goodwill, everyone wanted to go out to it for a visit, it requires thousands of personnel to keep it going, and now that it’s 20 years old, it needs lots of maintenance to keep it ship shape. My mind leaped to something else that’s greatly admired by the public, that people want to visit, that requires thousands of people to run, and that needs a lot of maintenance—our California State Parks. Like an aircraft carrier, the California State Parks System is not easily turned around, and sometimes you have to go south before you can go north. As for starting another organization, as the Parks Forward Commission suggests, to help state parks…Hmm… We already have a stellar nonprofit organization that supports the parks, the California State Parks Foundation, with 125 thousand members. Boost visitation to our parks among a full diversity of Californians and provide more information about how to get to the parks and the many ways to enjoy them; Promote the heath benefits of getting outdoors; engage youth and help them connect to state parks. Why? 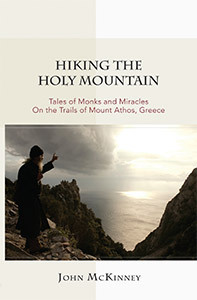 Because the hiking community is already leading the way to half the reforms suggested by the Commission. 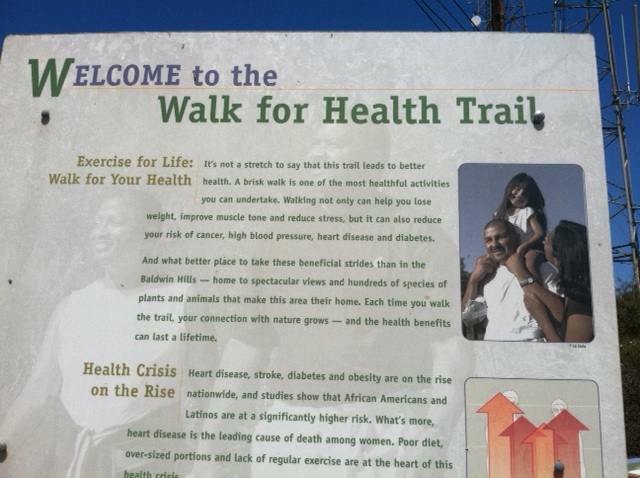 Hiking for health and fitness is encouraged at Baldwin Hills State Recreation Area. Just four miles away as the crow flies from where the hotel meeting room where the Parks Forward Commission is meeting, there’s a whole lot of hiking going on in two California State Parks. Both Baldwin Hills Overlook State Park and Kenneth Hahn State Recreation Area (administered by Los Angeles County) attract a wide diversity of hikers and are easily accessible by public transit. 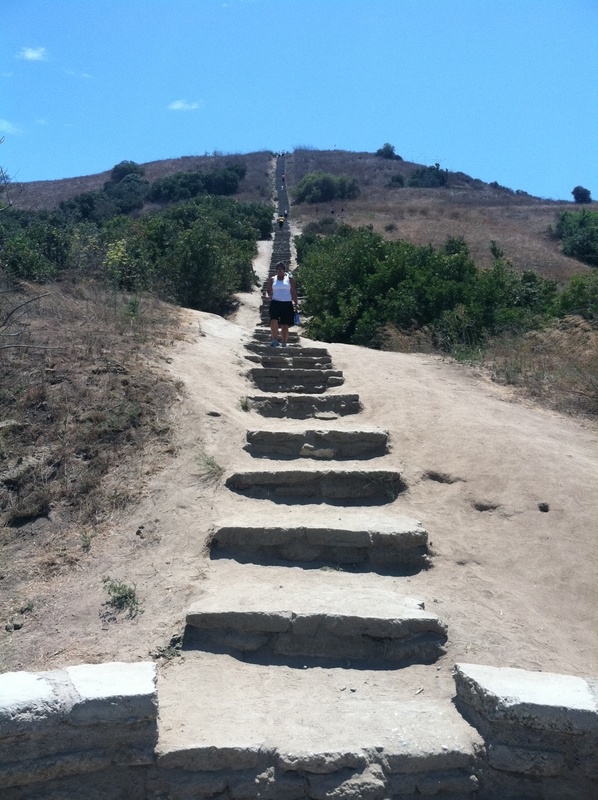 Baldwin Hills Overlook SP offers trails plus a long, long flight of stairs that offers a great aerobic workout. 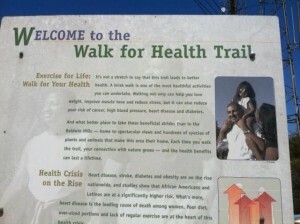 Kenneth Hahn SRA boasts a “Walk for Health” Trail and a fine network of footpaths. 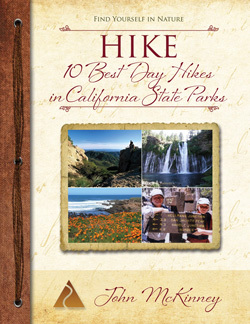 Hiking is by far the most popular form of outdoor recreation in California. And I’m pleased to report that the hiking community is successfully addressing some of the challenges highlighted by Parks Forward: helping attract a wide demographic of hikers to our parks, promoting hiking for health and fitness and encouraging young people to hit the trail. We have more, much more, to do to help the California State Parks system be all that it can be. Meanwhile, keep hiking and share the experience. Sometimes reform happens from the top down and sometimes it happens from the bottom up, from folks like you and me, one step at a time.